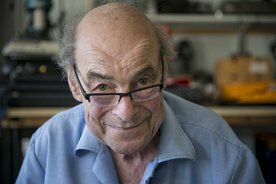 Our younger readers might not recognise the name Heinz Wolff and be wondering what banging tunes he put out, but that’s because he was a Professor of actual science. However for one generation, Wolff was the scientist par excellence, the man with the crazy hair and the thick accent who used The Great Egg Race to give children a love of science which never left them. Scroll down twitters tributes to the great man, and you’ll see scientist after scientist, expert after expert who made this world better say they owed much to Heinz. Sadly, he has died aged 89. We will now build a wonderful machine out of the things in our house and race it round the garden in tribute. With an egg, obviously.